Railway Recruitment 2015 Notification CEN 01/2015 Released - Apply online for RRB 2239 Vacancies SSE JE CMA DMS CDMS- Latest Employment News of Railway CMA DMS CDMS: The Railway Recruitment Board known as RRB had released official advertisement Centralised Employment Notice No.01/2015 for the various posts of Junior Engineer, Depot Material Superintendent, Chemical & Metallurgical Assistant, Senior Section Engineer and Chief Depot Material Superintendent on 27th June 2015 on official website. Railway Recruitment Board had invited online application form from eligible candidates from 27th June 2015 to 26th July 2015 up to 23.59 hours. The online application form of Railway Recruitment 2015 for the posts of SSE JE CMA DMS CDMS duly completed of complete in all respects will be submitted up to 26th July 2015 till 23.59 hours to concern RRB Region. Candidates must note down that they will not send hard copy / print out of online application of SSE JE CMA DMS CDMS to concern RRB Region. The application fee will be Rs. 100/- for General / OBC Category candidates. It is noted that SC/ ST / Women/ ExS/ EBC candidates will be exempted from RRB Examination fee for Railway Recruitment 2015. The interest candidates can apply online for Railway Recruitment 2015 by using following steps. 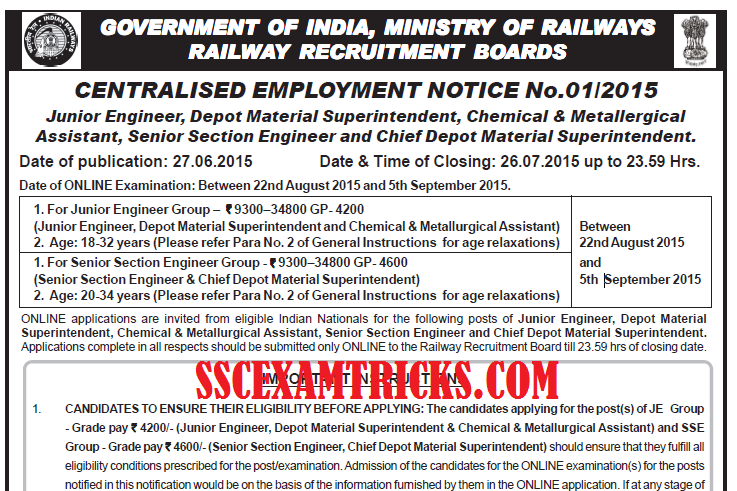 · Read carefully detailed official advertisement for RAILWAY Recruitment 2015. · Choose RRB Regions to apply for Railway Recruitment 2015. · Fill your particular details in BLOCK LETTERS in online application form of Railway Recruitment 2015. It is mandatory to fill Red Marked column in RRB online application form for SSE JE CMA DMS CDMS of Railway Recruitment 2015. · Note down application ID and password of computer generated dully filled in all respect online application form of Railway SSE JE Recruitment 2015. · Download e-challan of Railway Recruitment 2015 to make payment of application fee. · Take print of computer Generated online application form of RRB SSE JE Recruitment 2015. · Recheck and verify all the filled details in online application form of Railway Recruitment 2015. 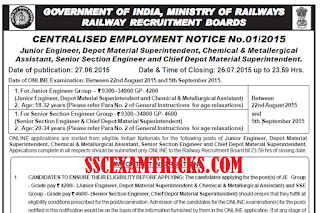 · Click on submit button provided at the bottom on the page of RRB SSE JE Recruitment 2015. RRB SSE JE Recruitment 2015 Application form Exam Date: The Final selection of the suitable candidates will be done through RRB Online Written Examination and Personal Interview of shortlisted candidates who will qualify RRB Exam 2015. RRB will conduct online written examination between 22nd August 2015 and 5th September 2015 for the posts of SSE & JE at various centres in all over the country. The tentative dates for RRB Exam 2015 will be conducted tentatively on various dates / the period mentioned in Railway Recruitment 2015 Notification CEN 01/2015. Candidates can download RRB Syllabus for SSC & JE online examination. Candidates must note down that the last date to apply online for Railway Recruitment 2015 Notification CEN 01/2015 is 26th July 2015. A huge numbers of candidates are waiting for Railway Recruitment SSE JE CMA DMS CDMS posts across all over the country. Candidates are ready to apply online for application form of Railway Recruitment 2015. They have been preparing for short cut tricks to achieve cut off marks in RRB from various coaching institutes. All eligible candidates can apply online for RAILWAY 2015 on official website. It is advised to the candidates that they must read carefully official advertisement for RAILWAY Recruitment 2015 to know about age limit, eligibility and qualification, how to apply online for RAILWAY posts which are mentioned simply in detailed advertisement. RAILWAY Recruitment 2015 Notification CEN 01/2015 can also be downloaded from the direct link given on this page. Candidates can download Format of the Application form for pre examination training is available on the RRB website. Candidates can download Reasoning tricks, English Tips Techniques, Math short cut tricks with memory techniques based on Time Management concept of read once and memorize forever to achieve good result and cut off marks in Railway Exam 2015. Railway Recruitment 2015 Final Discussion: For getting latest news about RRB latest jobs, admit cards, results, scorecard, counseling schedule and document verification of the candidates visit regularly on sscexamtrick.com. Furthermore readers can download tips-tricks & General Awareness questions answers sets for Railway Recruitment 2015 prepared from most popular books to the candidates to achieve cut off marks for Railway Recruitment 2015.